I’m a Chanterelle lover. It’s not for nothing they are called the “gold of the forrest”. This is my healthy comfort food recipe for a hearty Chanterelle stew with kale. I use frozen wild Chanterelles in this recipe which can be substituted for fresh Chanterelles when in season or other wild mushrooms more common to your specific region. Let the mushrooms gently de-frost in a deep frying pan for approximately 5 minutes. Once the mushrooms are half done, remove them from the frying pan and set aside on a separate plate, include any liquids. Add rapeseed oil to the frying pan, put it back on the stove, add onion, garlic, and kale. Fry on medium heat while stirring. When the onion is translucent, add the chanterelles to the pan again. Add white wine, dissolve the stock cube, with thyme, sage, dried mushrooms while lowering the heat and reducing the wine while stirring. Once most of the liquid is reduced, add the vegan cream. Lower the heat again, if necessary. Cook gently under a lid for 10- 15 minutes on low heat. Stir occasionally. Taste the stew and see if you prefer more salt, if so, add more soy to the stew. 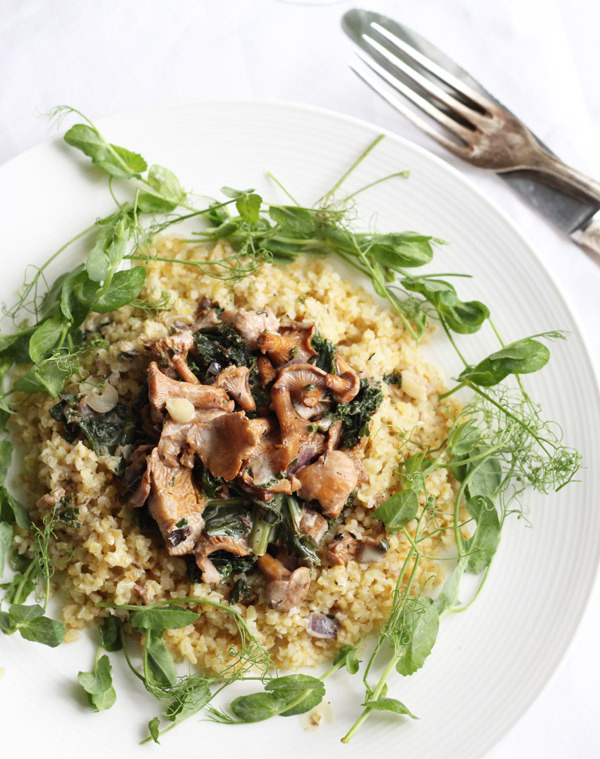 Serve with bulgur and plenty of greens. You can also add cooked bulgur last to the stew, then you may need to add more vegan cream not to make the stew to dry.